As Newark passes into the new millennium, its residents continue to discover fresh approaches to the age-old question of where they will live. If you really know the city and drive its streets, you quickly see that a difference is beginning to take hold in the cityscape. Just as a gardener becomes excited about discovering some new plant in the back of the flowerbed, new varieties of townhouses, rowhouses, condominiums, apartments and rental properties, church-sponsored housing and an array of private and public adaptive rehabilitation projects are adding to the increased stability of Newark housing. All this has happened because of the efforts of a variety of people—planners, elected officials and residents alike. Perhaps this melange of housing will make Newark’s next quarter-century brighter and more stable. As successful as the New Newark movement was in the late 1950s, nowhere as much attention was paid to the city’s housing problems as in the Renaissance movement of the 1990s. Today, not only is the modern downtown skyline considered important; the replacement of inadequate housing has become a mission of governmental agencies, churches, foundations, philanthropic groups and ordinary individuals. The Art Deco apartment house masterpiece at 19 Lyons Ave., now a condo, was built at the end of the Great Depression. By the coming of World War II, it was fully rented. Completed in 1939 by Isadore Portnoff, who built many Elizabeth Avenue apartment houses along the Weequahic corridor, No. 19 now is considered one of the city’s most elegant apartment houses. In its heyday, 19 Lyons Ave. was a center of political activity as well as a fine place to live. War Bond drives, Red Cross activities and all sorts of local political functions routinely took place in the building, probably because it was home to several members of the city commission, predecessor to the city council. Among the residents of the luxurious building was Mayor Meyer Ellenstein. Donald Karp, president and CEO of Broad National Bank, grew up there and remembers dropping by the former mayor’s apartment to watch evening television. During the war years, the building’s superintendent, James Scott, was also regional air raid warden. Eventually the elegant building fell on hard times and was closed and boarded up. Many predicted the end had come after the empty shell was invaded by squatters and addicts. But better days were around the corner. With the refinancing of the apartment by the Newark Housing Partners, a consortium of financial institutions and public organizations came to the rescue. Their goal was to provide construction help to improve housing in New Jersey’s largest city. Cali Associates of Cranford was called in to renovate the six-story apartment building, and it was converted into 66 condominiums raging in size from 650 to 1,200 square feet and in price from $85,000 to $95,000. Through efforts of the New Jersey Housing and Mortgage Finance Agency, qualified buyers were able to put down as little as 5 percent of the mortgage cost, pay two points, and receive a 30-year mortgage at 8.5 percent. On June 23, 1988, the new No. 19 Lyons Ave. opened and the five-bay front, pink and tan brick building once again became one of the best residences in town. Its romantic 1940s sunken living rooms, Art Deco-styled interiors, handsome lobby, great views of New York from the roof garden and proximity to a great park along Elizabeth Avenue all make the building a fine place to live. Another current source of housing in Newark are the units made possible through church sponsorship. Some developments are small, others enormous. Overall, the combined forces of secular and religious groups have proven a powerful contributor to city home-building. Two examples of this type of housing are Georgia King Village and the St. James AME Towers. Georgia King Village, a 420-unit housing complex, was described in promotions as an 'innovative housing project in the planning for more than nine years.' It came about largely through the efforts of the Rev. Horace Sharper, pastor of Genesis Baptist Church. The $30 million project, built with state, federal and city funds, aimed to combat poverty and poor housing by providing low-cost, nonprofit housing for local families. The T-Sault, or 'Total Assault on Poverty,' program eventually produced two 18-story towers of precast concrete along with 175 townhouses for larger families containing three, four and five bedrooms. The high-rise buildings were designed for senior citizens and smaller families. Plans called for a commercial sector to be attached to the development, providing stores, a day care center and a supermarket. The idea for the development came from Dr. Benjamin Payton. After Payton formed the Newark Committee of Inner City Ministers, Sharper’s group was reorganized. The Newark Housing Council provided seed money for architectural planning and engineering. A 25-member tenants’ senate assists in the management of the building and in formulating and carrying out community rules and regulations. A nine-member tenants’ commission supervises health services, public safety and recreation activities. Minority architecture and engineering firms were employed to construct the development, which is located at West Market and Bergen streets. The two towers, the adjoining townhouses and the finely clipped hedges with the sign Georgia King Village combine to make a city housing landmark adjacent to the old Martland Medical Center. St. James AME Towers is another example of church-sponsored or -owned housing in downtown Newark. Built in 1973, this 21-story building was funded through the New Jersey Housing Finance Agency. The building at 440 Washington St. is home to more than 500 residents who represent a wide variety of backgrounds and cultures, according to building manager Darleta Cross. Amenities include 24-hour security, off-street parking and social services including lunch programs and a tenants’ association. There are laundry facilities on each of the 20 residential floors. Drive by this 25-year-old building and notice how good it looks. Careful management and attention to the building along with tenant involvement has kept it looking like it was only just built. ’’Twofers' is an interesting concept in American public housing, one that is probably unique to Newark. It is an attempt to merge public and private housing for the immediate improvement of a specific community. According to former Newark Housing Authority Director Harold Lucas, the concept involves building a duplex and selling it to a party of unrestricted income. The other side of the building is then rented to a candidate eligible for public housing or with a limited income. As a result, purchasers receive added income while people on limited incomes get a good home in areas where housing eyesores or nontaxable, abandoned property would otherwise exist. In this equation, everybody is a winner. The community is also a winner, since preservation is not dependent upon a remote governmental agency moving slowly to remedy a neighborhood problem. Responsibility equals results. Rosemary Hocking, the city’s development director, said housing development in Newark has accelerated to the point that in 1997, there were 52 projects in the pipeline (1,776 units), costing an estimated $187 million. That’s a pretty impressive accomplishment for this or any other major American city. Basically, current development has two goals: to provide model home ownership instead of public housing, and to address the housing problems of moderate- and middle-income families. Forrest, spelled with two 'r's, and Hills, with an 's,' is one of the city’s newest and most northerly housing developments. It’s located in the North Ward, along the upper end of Summer Avenue at Halleck Street. Built in the late 1980s, this investment took place in a part of the city that needed reinforcement of its basic housing stock. It was financed by the First Jersey National Bank, whose president called the project 'a key development' and hoped that other banks would invest in the city. The developer was Waterfront Invest of Hoboken, which had participated in similar projects in Hudson County. According to a news article, one purpose of the development was to provide quality housing for the community without attempting to bring in outsiders. The result was accomplished by constructing three buildings with 132 two-bedroom units, creating cozy but wisely allocated living space. Unit prices ranged from $95,000 to $140,000. Condo owner Michael Ng said his home not only is inviting and suited to his needs but is part of a project that has improved the area. Forrest Hills, he believes, provided the stimulus for community cleanups and spruce-ups, renovation and gardening efforts. If you are looking for the excitement of loft living in a well-converted factory in the center of a bustling area like Chelsea or Tribeca, you don’t have to go to New York. It’s right here in the Ironbound, on Hamilton Street at the Chocolate Factory or Bruen Condos. The former factory building is now a condo, originally worked on by Stanley Lichen but taken over the Elegant Resources Inc. and opened in 1990 by Arthur Pimental, Augusto Gomes and Arthur Rosa. The restructured building is a collection of 25 residential units, ranging from studios to three bedrooms—all totally different from each other. Some have skylights, private decks, inside parking, cathedral ceilings and interior brick work, as well as zigs and zags that are part of the basic factory design. Betsy Wrobel, the building’s first condo purchaser, fell in love with her new home at first sight. Its eight-windowed tower looks out all around the city, taking into view the high-rise skyscrapers of Newark’s nearby office corridor with its twinkling night panorama, the commercial and residential expanse of the Ironbound and the quietly flowing Passaic River. Wrobel considers the building a good place to live and thinks of her neighbors, who are from a mix of backgrounds, as family. Another resident, architect David Robins, sees the building’s successful conversion as particularly satisfying. The century-old building’s central courtyard, its location in the very middle of city life and its accessibility to mass transit all make it an especially attractive place to live and share with friends, he said. Bruen Court, originally the Brass Works on Hamilton Street, is nearly a mirror image of the nearby Chocolate Factory. Its 18-unit bi-level apartments with hardwood floors, spiral staircases, irregularly shaped openings and all sorts of factory-designed interior motifs complement its pink brick exterior walls. Completed just a few years ago, it is on the few remaining red-brick streets in the city, and its residents compose a virtual United Nations, according to condo owner Lisa Aragon. Today, the Hamilton Street neighborhood has come back to life, and its once-lonely streets are busy. Perhaps even more important, the two converted buildings have helped lighten yet another dark corner of the city and have become some of the best places to live in downtown Newark. New housing is going up everywhere in the Ironbound. One developer, Lucky Realty Co., has created many three-family homes in the $300,000 price range. Mortgages carry a low 6.35 percent interest and zero points, and the owners can benefit from renting the other two apartments. In 1998 alone, there is the potential of 400 new families or 1,500 people being added to the population of this section of the city. There are many new homes along Oliver, Chestnut, St. Francis and Main streets, while older homes in the Ironbound continue to be remodeled and renovated. 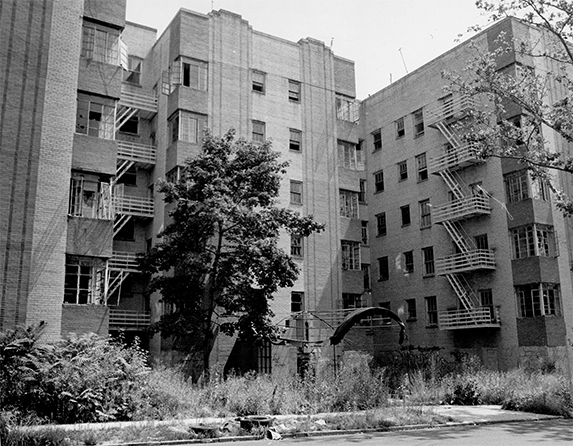 From the early Lenni Lenape longhouses to Portuguese-tiled rowhouses, from Passaic River summer country retreats to 1950s housing projects, and from elegant Forest Hill mansions to a comfortable suburban houses in tree-lined Weequahic, Newark has experimented with every type of housing found in urban America. It will probably continue to do so as long as somebody is looking for a better place to live.